Having invested time and effort in preparing and enjoying your photography session, the next decision is which images to select and how best to display them. There’s something so very satisfying about seeing the signature image from your photography session everyday. Whether that’s catching a glimpse as you pass en route to the washing machine with arms full of laundry, as you pick up your keys to head out through the front door or relaxing with a glass of wine in your favourite chair. That said, I appreciate that choosing which image to display, where and how isn’t always easy and that the choices this brings can be over-whelming. That’s why, during your pre-session consultation I’m happy to share advice on this very topic. In the meantime, here’s some pointers to help you create great wall art. #1 Size up your space – it’s a common mistake to underestimate the size of a wall resulting in a display which is too small. Measure up and consider whether landscape or portrait will be the best fit. This may narrow down your image and/or wall options. #2 Colour schemes – do the colours in the image you’ve selected suit one room in particular, consider surrounding decor and colours you may like to accent or compliment. Consider this in advance of your shoot as the accent colours could be incorporated into your clothing scheme which will ensure the pictures blend against their setting when displayed. #3 Frequency – if you’d like to see the image as often as possible, start by considering walls in high traffic areas or rooms where you spend a lot of time. To illustrate #1 here’s a wall display guide providing comparison of popular sizing options displayed above an average sized sofa. The good news is that this guide is also available to download which might be a handy reference when you’re planning your own wall display. Feel free to download it for free here. 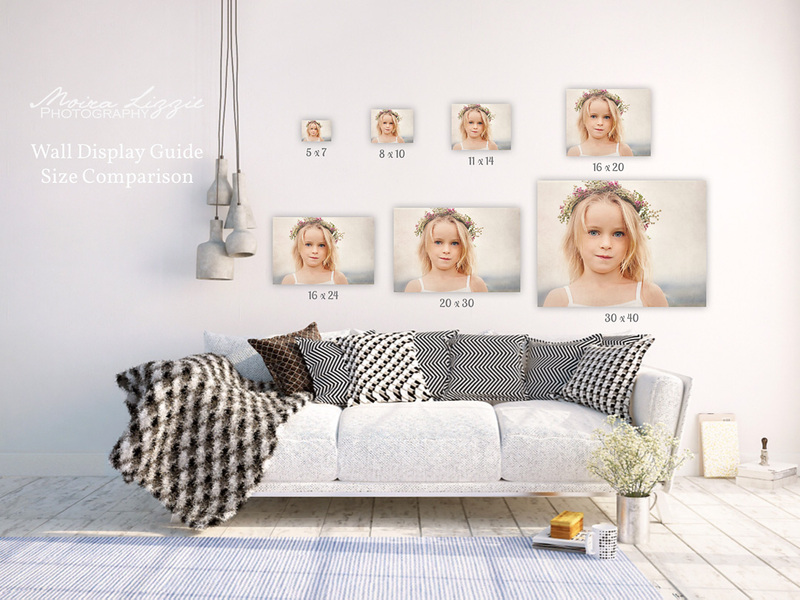 Once you’ve made your image selection I’m also on hand to provide professionally printed and crafted framed products – and if you can’t find what you’re looking for I’ll do my best to source the perfect solution for you and your home so that everytime you see your images they’ll bring a smile to your face. Not only because you finally got around to booking that shoot you were thinking about but you’re enjoying the images displayed around you every day! Moira is a Southsea photographer who works throughout Hampshire and the UK. She specialises in children and families and is a member of the British Association of Professional Child Photographers.For more details visit her website or facebook page.